In 2006, I rode a bicycle from Newport, Oregon to San Francisco. The coasts of Oregon and Northern California are, quite honestly, a Neverland. Small craggy islands formed by million year old lava flows from Idaho, known as stacks, protrude from a violently beautiful Pacific Ocean. Misty coastal fog rolls over and between it all. You can be above the clouds one moment, and in their soaking midsts the next. Riding a bicycle through it all, you have an opportunity that no other means of transportation can really provide, in that you’re free to sit back and watch the world go by at a pace neither hiking’s slow trod where footsteps must be watched nor an automobile’s dashing through it all wishing you had more time to look at your every last surrounding. I took ten days to do that trip, which was still a fairly quick jaunt down the coast. Napping on beaches, sleeping in state parks, eating bowl after bowl of clam chowder for energy, it was truly one of the most memorable experiences of my life. But it was a hard one for sure. No bathroom, no rooms at all, save my tent, to call home. My legs were sore, my back was sore, my crotch, most of all, was sore. Would I do it again? I certainly hope to. Now, imagine if you made a lifestyle out of this method of travel. If two wheels of your own muscle-powered propulsion were your every day adventure. I was lucky enough to speak to two people who’ve made this their means of exploring this world. One was the mother of a family of four, including her husband and two young boys. The second is a young man, traveling solo around the world on his bicycle. It was a pleasure hearing both of their stories and I couldn’t be happier to share them both with you. Way back in the 1900s, a young man named John Vogel was growing out his hair and riding bicycles all around the world. He exchanged tire tread for travel everywhere from Alaska to Albuquerque, Norway to Australia. Meanwhile, in another part of the world, a young woman was arriving in Honduras, about to experience life as a Peace Corps volunteer. 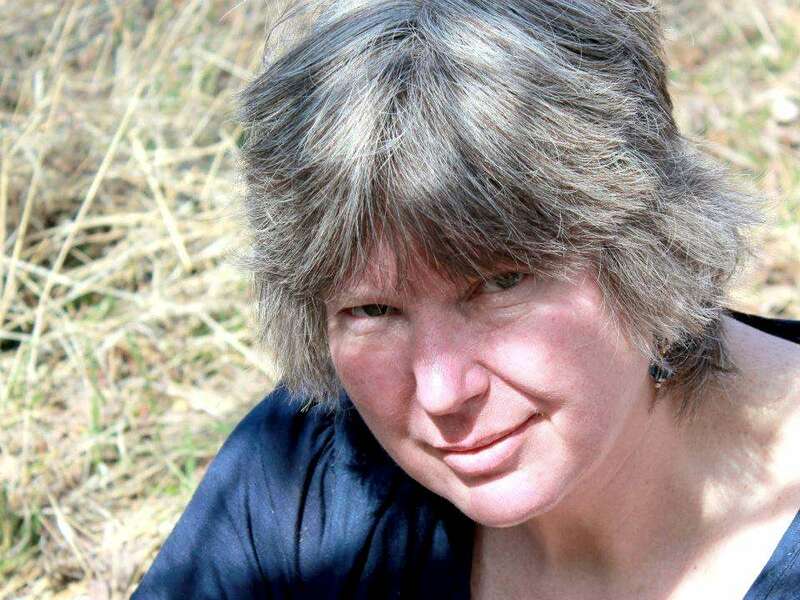 She would soon discover that, despite being a seemingly drastically different culture, the people there were not that much different from those she’d encountered in the United States. 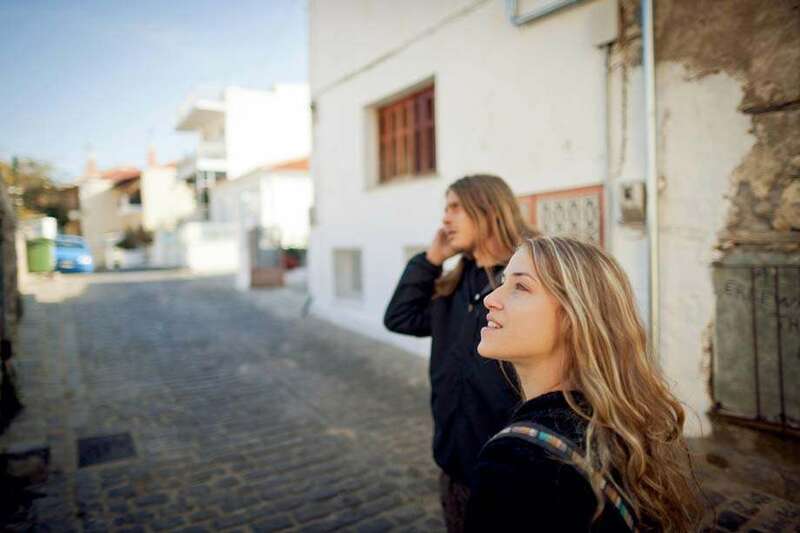 She thoroughly enjoyed her time with that organization and, using the money they give volunteers to re-establish themselves in their homelands, began backpacking through more of South America. Eventually she would return to the United States and, a few unorthodox experiences later, decide to put an ad in a magazine focused on extreme adventuring. She was looking for someone to cycle around Asia with her, and figured placing an ad in a magazine geared specifically toward people who were unafraid to take wild risks was exactly the way to find a companion. 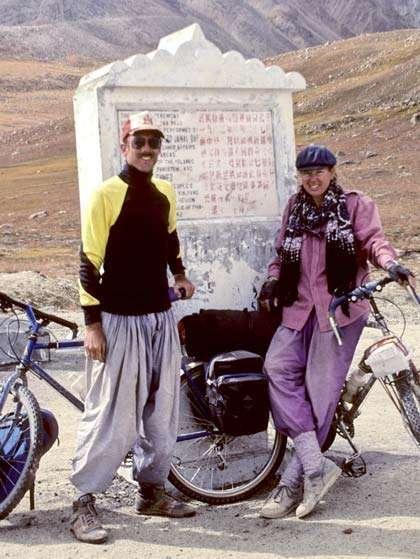 Her ad was not answered directly, but even better, in a twist of fate surely out of a modern comedy: someone else had placed a similar advertisement, looking for a cycling partner to accompany this person from Pakistan to China, and then onward. Both ads mentioned leaving in June. Presumably, both of these people were a little crazy. It was a match made in heaven, or at least some bicycle scrapyard afterlife where an all powerful Cupid spends his days fixing up bikes and his evenings fixing up adventurers. The woman in the story is Nancy Sathre, and her happenstance partner in random similar advert crime? John Vogel. Six months later they would be engaged to be married. A few years later, children. So what does a couple consisting of two world-class travelers do when children arrive? Sell the bikes, buy a house and get to saving for retirement? Not entirely. Though raising young boys did mean a lull in touring around the world on bicycles for Nancy, they still managed to get around the world via other means, children and all. “In 2004, we met the owner of the KHS bike factory in Taiwan, and decided to have some tandems made for us with the idea of taking the boys out touring.” The following year they spent four days riding into the mountains and canyons around Boise, Idaho. Then, when their boys Davy and Daryl turned 8, they spent a year cycling around the United States and Mexico. A year and a half or so later, they were all on bicycles, leaving Prudhoe Bay in Alaska, with their sights set on Argentina. For the geographically challenged, that’s essentially the top of the Americas to the bottom. With kids. How many times have you considered how dangerous it would be to simply cross into Mexico, let alone cycle it’s breadth and then continue into territory even less familiar to us Americans? Nancy, son Daryl, husband John and son Davy in Bolivia, posing for a photo for the Guardian. Over the course of three years they cycled away their days, slept in tents at night, repeat. They battled hills, weather and the necessary timelines required to avoid winter in both Alaska and Argentina. Twice, in three years, they took extended breaks–6 weeks each time–once in Ecuador while young Davy required surgery to remove an ingrown toenail or two, another time when John required his entire mouth be redone by a Bolivian dentist. To anyone who sees full-time traveling as a permanent vacation, ask yourself if what you spend your everydays doing is as physically and mentally demanding as such an excursion? Signing up for a 17,000+ mile journey through fifteen countries and the entirety of the New World is one thing.. Actually pulling it off though? Wouldn’t those boys get over it at some point? I certainly learned the value of water. And a toilet. What was she longing for specifically, though? The comforts of a warm bed? A luxury day spent at the spa? Not exactly. “It wasn’t a microwave that I wanted – it was water. A consistent, reliable source of water. A river, a lake, a pond, a tap – it didn’t really matter as long as I had water. While out on the bikes, I certainly learned the value of water. And a toilet – that was the other thing I really missed. We take water so very much for granted in our modern society, it’s always just a turn of a tap away. Something so vital to our existence has become a given in the Western World. Until you leave behind plumbing and realize just how much our lives will revolve around that clear cold liquid were we living in a more natural state. “What got me through?” she recants. “The dream. 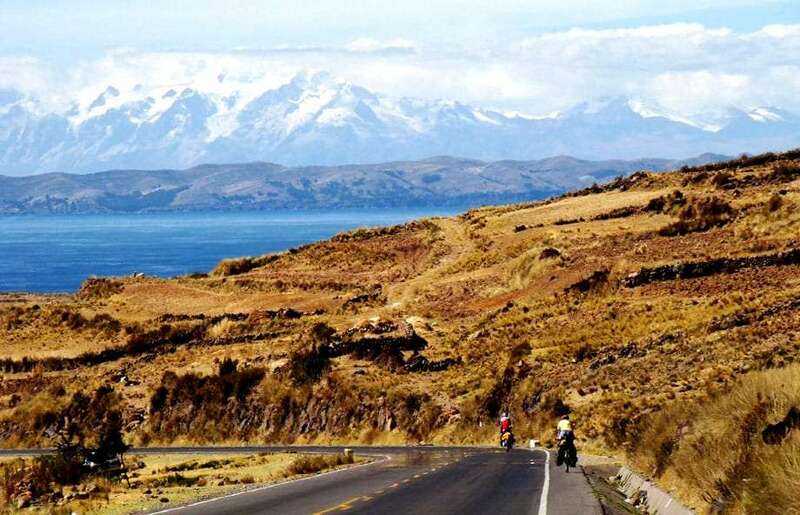 Reaching Ushuaia,” their ultimate destination in Argentina, “on our bikes was such a big goal that we were so committed to, I was willing to go without in order to make that happen. “I honestly can’t tell you if it was my commitment to the dream, or my sons’. Did I continue on because I didn’t want to let them down? Or because I wanted it for myself? What came of all of that commitment? 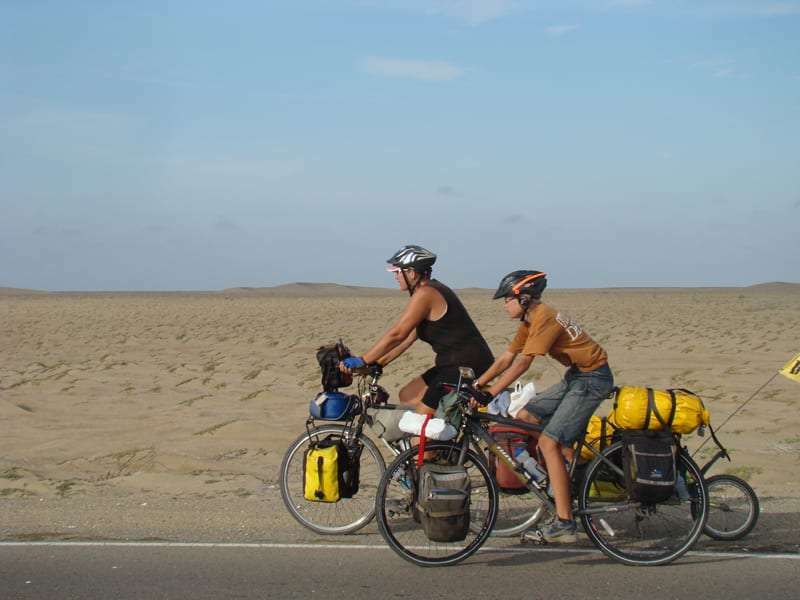 Aside from some serious family time, facing hardship and struggle peppered with gorgeous views and mind-opening new experiences, the boys Davy and Daryl now hold the world record for the youngest people to cycle the Pan-American Highway. That’s one of those achievements that, at such a young age, will undoubtedly propel your self-esteem for decades to come. At the very least, it’s an accomplishment greater than many of us will attain in our entire lives. Inspiring, to put it mildly. But what about the little details? Did they really live in tents the entire time? Was it safe? What were the people they met like? 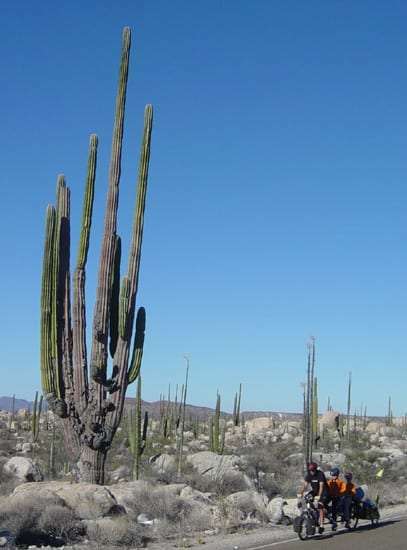 Cycling through the deserts of Peru. The whole story at Family on Bikes. Nancy relates that, in her considerable experience traveling the world, people are generally more similar than we are different. I asked her this specifically. Her answer? “Absolutely,” and with vigor she professes, “people are all the same! Mexico? I would go there in a heartbeat. Not that she’s without caution. While people may all be similar at our core, there are places in this world which affect their situations and therefor the reality of what encountering new people will be like. So that’s Pakistan, a country we’re shown to be a battleground for the Taliban on a daily basis. What about the countries they rode through together, those in South America, Central America? What about Mexico? We hear so many horror stories from our neighbor to the south, it’s amazing how vastly different that nation must be, right? “I would go there in a heartbeat.” Nancy is speaking of Mexico. So who do you trust? How safe is it to load up your family and move around the Earth? Nancy has a simple solution for that. More to the point of the friendliness of people from other nations, of people in general, the family did not sleep in tents the entire duration of their trip. They were put up on numerous occasions by hosts offering them a warm place to stay for a night or so. People who are willing to take strangers into their homes, who actually seek out adventurers to provide a respite from the rigors a life spent outside on bicycles must portend. “Sometimes, we reached out to people through WarmShowers–a hospitality site online specifically for bike tourists. 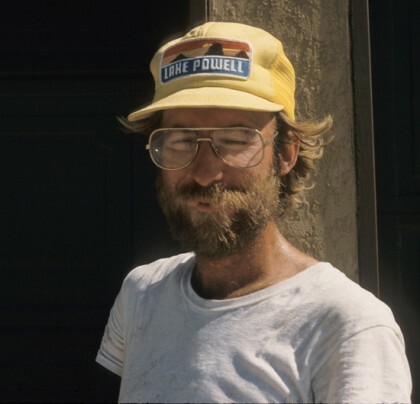 Most often, however, if was someone who heard about our journey through the media and wrote to offer us a place to stay when we passed through their town.” One such host was actually the then-current world record holder as the youngest person to have cycled the length of the Americas. It seems folks who have the gumption to take on such endeavors aren’t out for the glory as much as they are welcoming the companionship of their fellows. Was it all fun and games? No. Nancy admits to some small defeats, and how she turned them into triumphs. “The hard times are always mixed with good times.” These are the sentiments that make reading her journey so interesting, she’s not afraid to paint the whole picture. She doesn’t sugar coat such an experience as being akin to a day at the movies or a roll in the proverbial hay. 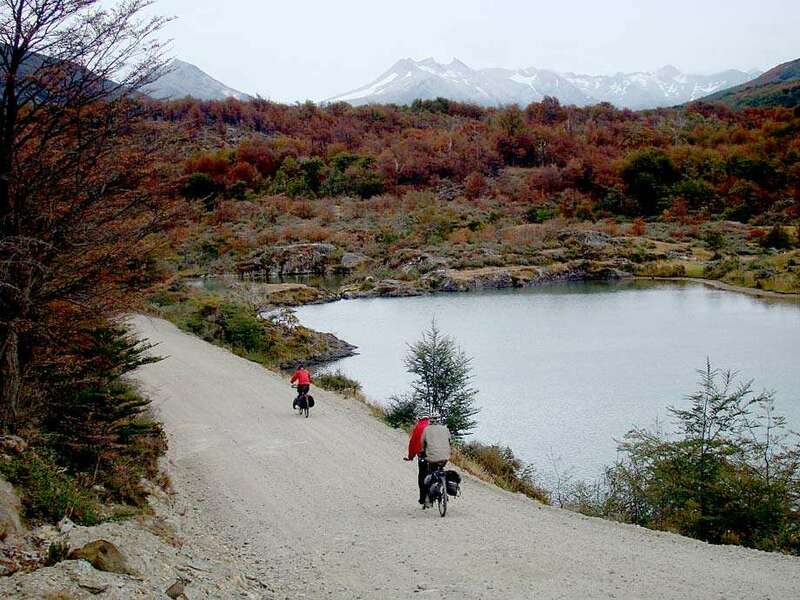 “One day in Argentina,” she recalls, “we were pedaling furiously to try and make it to a host’s house. The idea of being in a real live house rather than our tents was riding in the forefront of our brains all day–and then it started to rain. We were on a dirt road, which was quickly turning to soup, and it was cold. Riding on a muddy road in a cold rain is the pits–trust me on that one.” So close, as they say, yet so far away, they admitted defeat for the day. But adventure is full of setbacks, of coming short of a particular goal you have in mind and struggling with what might be easier and achieving said goals. They decided to make it happen. 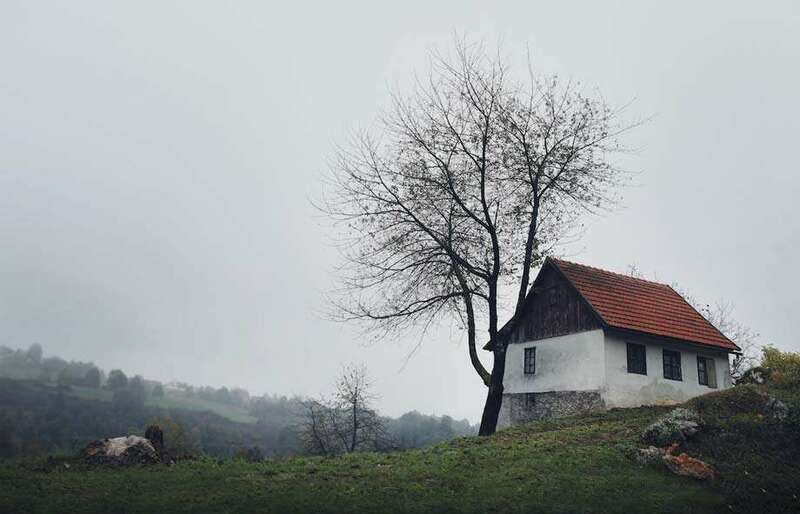 Their was a warm place to call home for a moment or so, and the temptation of such a reward far outweighed the effort required to make it all happen. Isn’t that really the difference between those of us who struggle (which is all of us), and those who overcome? The get up and go we each latch onto, and how willing we are to hold onto it. The tale leads Nancy into another part of her memory, one where jealousy could have perhaps taken over their adventure and cut the journey short in favor of more passive means of transport. “A few days later, I sat down to write a blog entry and, funnily enough, I wrote about how that day cemented in my mind how traveling on bike was better than in a bus.” The following is an excerpt from that blog post. The other day as we cycled through the Argentine Lake District in pouring rain, I wasn’t having much fun. The plentiful lakes we passed were nearly hidden in the clouds and I most likely missed many of them altogether. Rather than the vibrant green of the trees and magical blue of the lakes that we should have seen, everything appeared to be some shade of gray. It wasn’t the lovely jewel of Argentina that people come from the four corners of the earth to see. My fingers were freezing, my toes felt like they would fall off and crash to the ground the second I took off my shoes. It was wet, it was mucky, it was not a whole lot of fun. But even so, when a bus passed by and the passengers opened their windows and stuck their heads out to gawk at us fools pedaling in the elements, I couldn’t help but feel a little bit sorry for them. Yes–for them. Don’t get me wrong–I was feeling plenty sorry for myself. It wasn’t exactly perfect bike touring conditions, but even so, I was out there in Mother Nature’s world. I was communing with nature, as my father used to say. And them? They sat in a climate controlled world in a glass-enclosed cage. Their windows were fogged up so they missed most of even the pathetic bit we were seeing. They didn’t feel raindrops drip off their noses or see the patterns water makes when a car wheel splashes it out of the mud puddle. Yes–they didn’t even feel that water splashed onto their legs. Talking with Nancy, it’s clear that they made this journey for themselves. It was not to prove anything to anyone else, or even for the primary purpose of the boys becoming the youngest people to ever accomplish such a feat. But it wasn’t only for themselves, at least in retelling it she makes it clear that there’s a bigger goal here. Meanwhile, in another part of the world, and still on his bike, adventurer, photographer and cyclist Rob Lutter is a little less than halfway through his own bicycling journey. No, he’s not cycling the entirety of the Americas. He’s not even cycling the breadth of Europe and Asia or any one continent. He’s riding his bicycle around the world. Two years ago, in 2011, Rob picked up his life in London and headed East. Since then, he’s ridden 15,000 kilometers (that’s over 9,000 miles for the Americans out there) through France, Greece, Turkey, Uzbekistan, China and so many zigzag places in between. And he’s done it alone. I’ve not lost my fear…but the unknown–the water, the stars, what comes beyond death–is fascinating. Many of us would be frightened to even “endure” a layover in countries with names like Azerbaijan or Kyrgyzstan, the illusion of some unknown threat ready to blow us up at any moment lurking in our “modernized” minds. Rob was not without such thoughts as he left England, left even Europe and moved, one revolution of his tires at a time, toward the Middle East. He used this fear to propel himself through it all. Excitement built up inside of him, pushed down into his calves and was transformed from mere potential into raw kinetic energy. He goes on to relate that, in reality, many of the locals in the small villages and rural areas he’s pedaled through were likely more afraid of him. But Rob is not necessarily exceptional. He is not without struggles of his own. That’s not to say that he has certainly become an exceptional case of humanity, but he was born naked into this world like all of the rest of us were, with the same planet beneath his feet, the same air in his lungs. He was not handed a worldly education and a small fortune to make his way around the globe as he wished. “I speak no other languages and I am not very good at learning. I get by, mostly, by sign language… not official sign language but more me looking like a monkey in front of locals, waving my arms around to make the shape of the world and the movement of pedals going round,” he laughs. He’s raised the necessary funds he needed to make the first leg of his journey entirely on his own, working a somewhat regular job in a big city, sleeping on friends’ couches to save money, cycling around England to loosely prepare himself for what would become the next several years of his life. Along the way he’s found the kindness of strangers–similar to Nancy and her family–to help. 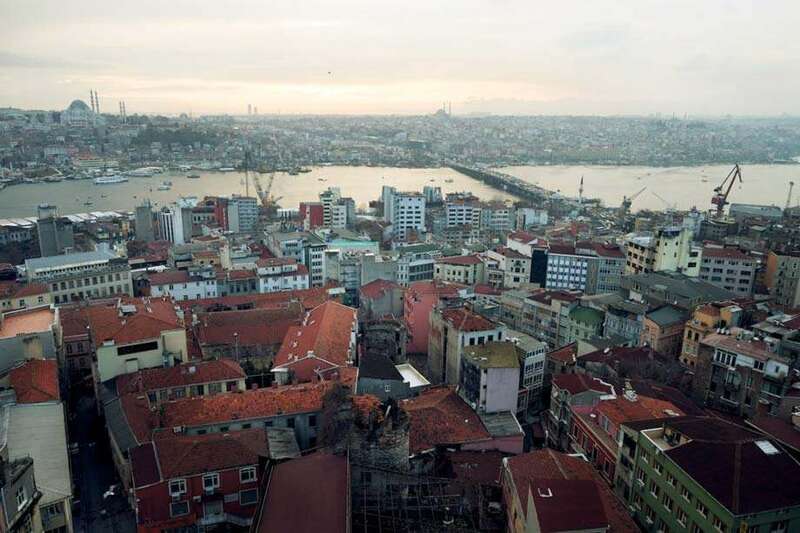 He put three months in “helping out”, as he describes it, in a hostel in Istanbul. During that time, he learned a few simple phrases. “How are you? How old are you? Do you have children?” That sort of thing. Learning a new language is no small endeavor, and even familiarizing himself with a few tidbits of small talk are a testament to the type of man he is: one who’s not afraid to improve upon himself. That’s not something you’ll find innate in every white guy from the modern world you run into. We’re more likely to be born thinking we’re the top of the food chain than seeing ourselves as another kink which could do with a little foreign grease in our gears. This has always been a project for me. Though he’s recently pulled off a successful Kickstarter campaign to fund the next leg of his journey, he was adamant about doing the first stretch on his own. “I was a nobody–I probably wouldn’t have been able to generate money if I had wanted to,” he admits. But it seems to have been more than that for Rob. Rob wanted to give himself the extra impetus to deliver the photos and videos and writing that the journey was supposed to be about for himself, even when perhaps a long days ride multiplied by weeks didn’t leave him feeling so spry and creative at the end of the day. So Rob is not rich, nor was he necessarily well-traveled or well-learned when he began the adventure. But surely he is exceptional in some way? There must be something that sets him apart from the rest of us, some reason we can give ourselves as to why he is able to do this and we’re not. Well, Rob does suffer from Obsessive Compulsive Disorder, if “suffer” is as correct the term as “conquers”. I asked him whether or not he thought that might actually be a reason he was able to strive for something as monumental as this journey, if perhaps having already needed to overcome a difficulty most of us don’t face in life prepared him in some way for it all. “Because OCD is just there, in me, even though it feels separate to who I really am–in a bad way–its not something that I consider anymore. I have had the problems all my life. So if I were to think ‘If I did not have OCD would I be cycling?’ is like asking ‘If I did not have OCD would I be the Prime Minister right now?’ I know nothing else, no other time where I did not have it. So therefore when I think about myself cycling the world I don’t think I can do this because I already have struggled with my mind…it’s hard to explain, but its all one package, me and the OCD, so when I think about a cycling adventure I am just as scared or determined as any other person out there. Rob goes on to reveal that even the questioning of it all, even the fact that world knows something so personal about him that he worked hard at to keep to himself, secret even, for many years, was a bit difficult. It’s clear he doesn’t see the disorder as something that either pushed him into this life or prevented him from it. He speaks with humility, perhaps lined with a remnant sliver of some past embarrassment, but he does so beautifully. A man who’s cycled halfway around the world could take extreme offense, or could be downright haughty. But perhaps such a man would never endeavor such pursuits in the way Rob has. In the end, he makes it clear that while his DNA may have included OCD, what drives him is far more complex than any one factor. He admits that it has been a struggle throughout his life, but that “My adventure spirit however, is not about OCD–it’s about who I am genetically, my dad was a climber and my mum sportive and a pro windsurfer and I was given books as a kid on adventure and fantasy worlds and so I have always dreamed of bigger things and far off places… The OCD made me depressed in London and destroyed my ability to get on with people and create and work efficiently there, so it lead me to the point where I had to make a decision to change…but I believe it was my upbringing and my blood that made me decide that the answer was to travel. With every phrase he writes you can hear it in his voice, Rob is an amazing man who has achieved Everest-sized accomplishments but still struggles with who he is by nature. He is the definition of adversity overcome, and though he is perhaps afraid of what might be one day, he doesn’t allow that to keep him from what he actually is today: an inspiration if the word ever needed definition. At the same time, it’s clear that he is not just someone with OCD, in fact, that is barely a part of him at all, regardless of how much it affects him. Physically, it gets easier. Mentally? Harder. Rob Lutter is Rob Lutter. He’s a cyclist, an adventurer, and a modern day man’s man. Reading through his stories you can feel the longing he has to slow down as he meets kindred spirits in places like Greece, even as the road whispers incessantly in his ear to keep moving on. You can hear the reality of him as a person, not just another avatar and feed on the Internet, as he talks about winding along desert roads uncertain of where the next respite might come from, debating hitching rides occasionally to make necessary time in order to keep visas on track. His audience has grown to thousands, but he has taken the time to reply to even one of us, and to provide answers to questions that he’s spent years keeping hidden away. Which leads one to wonder, is the lifestyle he’s now chosen for himself made him a better person all around? Stronger, wiser, something more than the rest of us are. Something that, given the right amount of desire, we might all become. I wonder even if he simply feels stronger after all of this, or if it’s something more. If it even gets any easier as time goes on. The best answers, usually, are simple. He even states that he’d grown bored in China, physically at perhaps his peak and many, many months into the journey. He ended up crossing China in 90 days before stopping to refuel the coffers, access the Internet, and generally refresh the entire journey. By that point, he’d garnered a following of tens of thousands, raised £3000 for charity, and thousands more to help him complete the remaining 20,000 kilometers of Oceania, North America and on back to London. He promises to continue documenting his travels. 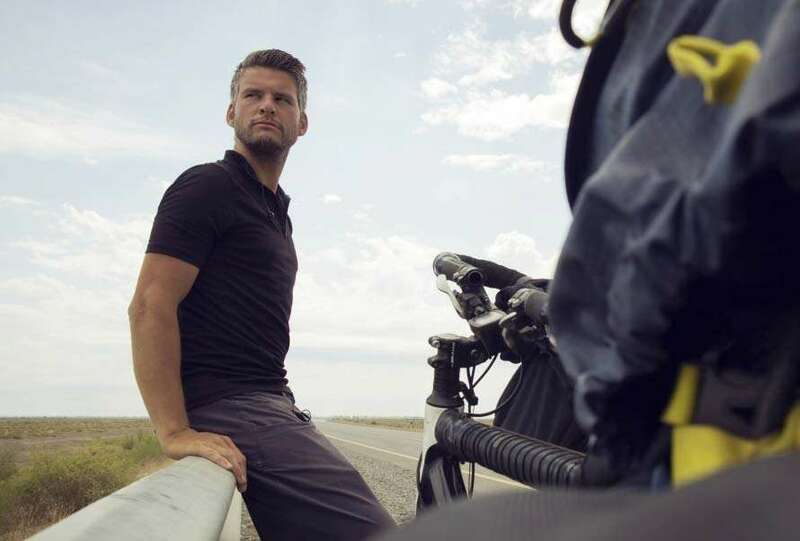 A young man who made the decision to ride his bike around the world has now become an inspiration, perhaps even a hero, to people around the very globe he’s navigating. Rob has never seen the journey as something he needs to accomplish in a specific time frame. He’s taken breaks before to immerse himself in the cultural of wherever he found himself at the moment, or simply to recharge for a bit. “If I am just racing, not seeing, not interacting with the world around me then the adventure has failed. In China it was becoming like this,” he admits. “Actually, I would rather take a week to ride a boring 300km stretch and take it easy, meet as many people as possible by the roadside to make it more interesting, rather than just blitz it in one ride to get it over and done with. Otherwise, mentally, it will just get harder and harder. Sometimes I forget that the journey and the here and now is what I am doing this for. “As soon as I stop enjoying it there is no real finish line. I will never finish. 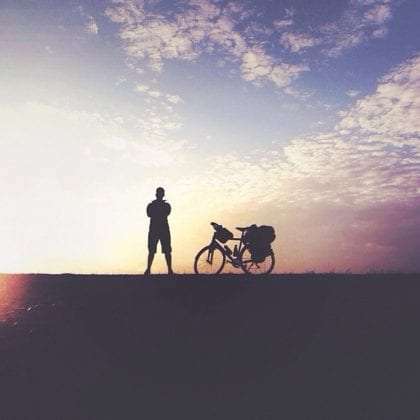 I will forever be cycling towards something I am not able to find.” The journey not the destination, it seems, is a universal reality discovered by all travelers, whether they’re on a simple day hike or conquering the world. 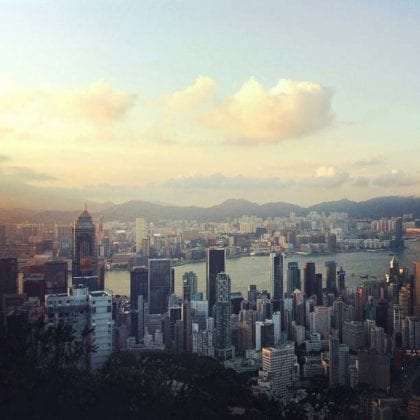 Rob left Hong Kong, and the firewalls in China which limited his ability to post even to his own website, less than a week ago. Before he did, he had the following sentiment on the remaining longer leg of his trip, which he now refers to as “the trip home”. 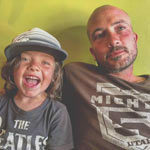 Read more about Rob’s ride around the world at The Lifecycle. Back to Nancy and her family, I asked her what all of this traveling by bicycle resulted in. What was the end net profit, if the culmination of such journeys could be defined in such a way. “What I’ve learned from all this is that we only have one chance at this thing called life. We’ve got one trip here on Planet Earth, and we need to take advantage of that. Life is too short to live a life that others want for you–it’s imperative that we make it our own.